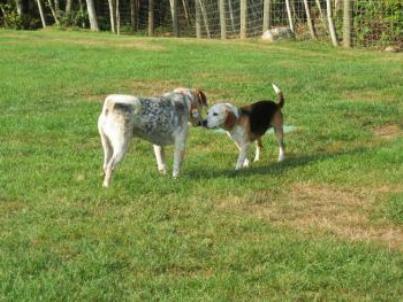 After being abandoned at a farm in Washington three months ago, an older male and female Beagle were taken in by the NOAH Center, an animal shelter in Stanwood, Wash. The two dogs, whom the shelter named Buster and Molly, didn’t seem to pay much attention to the staff. At first the workers figured it was due to their age — they are both about 8 years old — and the stress from being in the shelter. But then they noticed that Buster frequently walked into walls. Molly would often block him from doing so, and would nudge him through the doggie doors. “Molly is a seeing-eye dog, so for her brother she helps to make sure he doesn’t get into situations that could be dangerous for him,” Lani Kurtz, the shelter’s adoption director, told KOMO News. She said she believes the dogs may be siblings since they are the same age. Buster and Molly did get adopted out together after they were brought to the shelter, but unfortunately it didn’t work out. Their new pet parent’s home had an unfenced yard and no doggie doors — two important items this pair can’t go without. So Buster and Molly are once again available, but only as a couple. The adoption fee for both is $200. There is a $50 discount on Mondays, as well as discounts for seniors. “They are no longer spring chickens, and don’t have a fondness for children, so a home without kids would be best,” notes the shelter’s website. For more information, visit the NOAH Center website, call 360-629-7055 or email info@thenoahcenter.org.